DRY Weather and an allotment – what would you do on the allotment with less water? The workshop will be hosted by the NERC DRY (Drought Risk and You) project, the National Allotment and Leisure Gardeners Association (NSALG) and About Drought (knowledge exchange about drought). Background: In the DRY project, we are keen to work with different groups who may be able to give early warning of dry conditions in their communities and who are already aware of when there is a lack of rain and when the soils are dry. Allotment holders are one such group. We are also interested in different ways of using water in growing food (e.g. across cultures) and the seasonal demands that different crops have for water. share story and videos developed with allotment holders and Allan Cavell, NSALG in the DRY (Drought Risk and You) project. ask ‘What if’ for different drought risk futures under different climate projections in the Bristol Frome catchment. We will share some of the new science on forecasting and prediction in easily accessible ways so we can think about what the implications might be for growing on allotments. explore together what we might do on an allotment with less water. What options are available? 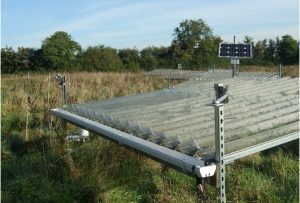 seek your advice about what sorts of resources would be useful as outcomes from the UK Drought and Water Scarcity research. What would be useful to allotment holders? (e.g. seasonal water advice; drought resistant planting). The day will be interactive and we will have a cartoonist working with us to capture our discussions. There is no cost for the workshop but we ask you to register by clicking this link by 18th May 2018. A buffet lunch will be provided so, if you have specific dietary requirements, please email dry@uwe.ac.uk. If you are coming by car you will need a parking space to be booked for you. Please email dry@uwe.ac.uk with your car registration details. Author About DroughtPosted on 23rd May 2018 6th June 2018 Categories EventsTags DRY-project, PastLeave a comment on DRY Weather and an allotment – what would you do on the allotment with less water? Join University of the West of England for a field trip with the researchers to discover the real-life effects of drought on our local grasslands, as part of Bristol Festival of Nature’s City Nature Challenge. The Drought Risk and You project integrates physical science with social science and narrative to produce a decision making tool to help individuals and policy makers plan their response to drought. Drought is a natural part of the UK climate but is predicted to become more frequent and severe in the future. Grasslands are by area the most important agricultural crop in the UK, and an essential feature of most parks and gardens. You will learn about the experiments being done by UWE’s researchers as they look at the effects of drought on plants and pollinators, learn about the types of measurement they make and why, and see some of the preliminary results. You can also help the team by making your own survey transect across the field and submit your findings to Bristol Regional Environmental Records Centre. Please note: we will be meeting on UWE’s Frenchay campus and walking down to the research site through a rough woodland track. The track and fieldsite are not accessible for wheelchairs or pushchairs. Please dress appropriately for working outdoors.This event is suitable for adults and older children (10+). community planning organisations, communities, and not-for-profit special interest groups. As well as hands-on interaction with key project datasets, delegates will be able to ask the experts about on-going developments and give feedback on how best they can be tailored to support your area of interest. The showcase will give the opportunity to participants to interact with other stakeholders and researchers. Book your free place now using the online registration form. The closing date for registration is 2 March 2018. Registration for this event is limited to four delegates from each organisation. We will contact you if this number has been exceeded. Please contact the Project Office at endows@ceh.ac.uk for further information. A showcase walk taking in the canals and parks of Birmingham, stopping along the way for conversations with key local stakeholders. Interdisciplinary talks from across the programme and from stakeholders detailing how the work has helped them. Networking opportunities throughout with a drinks reception after the conference. Registration from 09:15 with the showcase starting at 10:00 and closing at 16:30, with drinks and networking to follow. The closing date for registration is 2 March 2018. Please contact the Project Office at endows@ceh.ac.uk for further information. Keep up with news and events from the UK Droughts & Water Scarcity Programme and its projects at the About Drought website or follow @AboutDrought on Twitter. The focus of this workshop will be the co-development of a business toolkit for increased water resilience. It will exchange knowledge from the UK About Drought project (aboutdrought.com) about ways that small and medium sized businesses can become more ‘water resilient’. This workshop will be of particular interest to those running small and medium sized businesses that use water in any way in their business processes, and are exposed to different types of water risk. Participants will explore the ways in which water (from flood to drought) could affect their business, including opportunities for innovation. Sharing draft resources prepared by the About Drought team, we will discuss the design of a toolkit designed to help businesses think through their water resilience. This will include reflecting on the messages and messengers that businesses engage with and trust, along with the merits of incorporating water resilient thinking into wider Business Sustainability Management. Participants will be invited to contribute to the co-development of a water resilience toolkit of resources for small businesses that will form part of guidance to be rolled out nationally. All contributors’ contributions will be acknowledged.